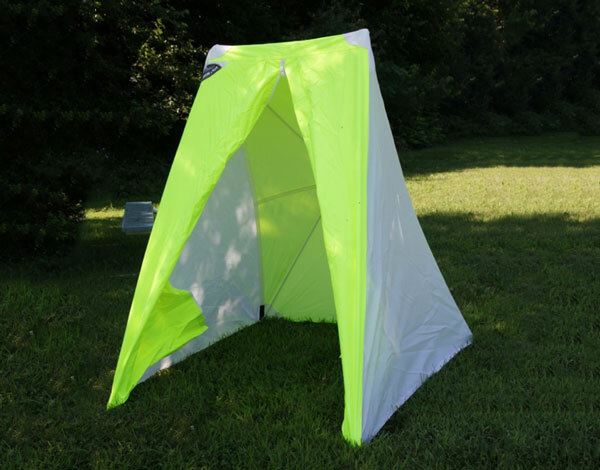 The Ped-Pal is designed to provide simple, low-cost weather protection. It’s ideal for pedestal work and similar bad weather tasks. Simple sun protection or a complete weathertight enclosure. About half the cost of the average work tent. Attaches to the pedestal with a hook and take-up strap. LIGHTWEIGHT – Only 15 pounds. Coated polyester cover with a fiberglass non-conductive frame. Pop out the rear frame. Extend the telescoping front legs. Secure the take-up strap and tension the shelter. Ready to go in less than a minute!